Science communication is broken. Let's fix it. I've already ranted about the problems with science communication. Even when a layperson gets access to a paper despite all the pay-per-view journals, the use of esoteric jargon makes it practically impossible for the public to read fresh-from-the-lab-bench science. For the last few months, I've been working on a solution through Draw Science. Now it's time to take off the band-aid and treat the wound. I want to make an open access infographic journal. We're talking the whole sha-bang: trademarks, corporation filings, DOI's, CLOCKSS archival, etc. 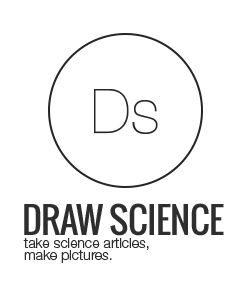 By the end of this, Draw Science will have the same legal legitimacy of PLOS or any other online scholarly journal. The barrier is that this costs a little bit of cash; cash that a college student like myself doesn't have. PS. Sorry for disappearing for a while. I was busy trying to make this happen!